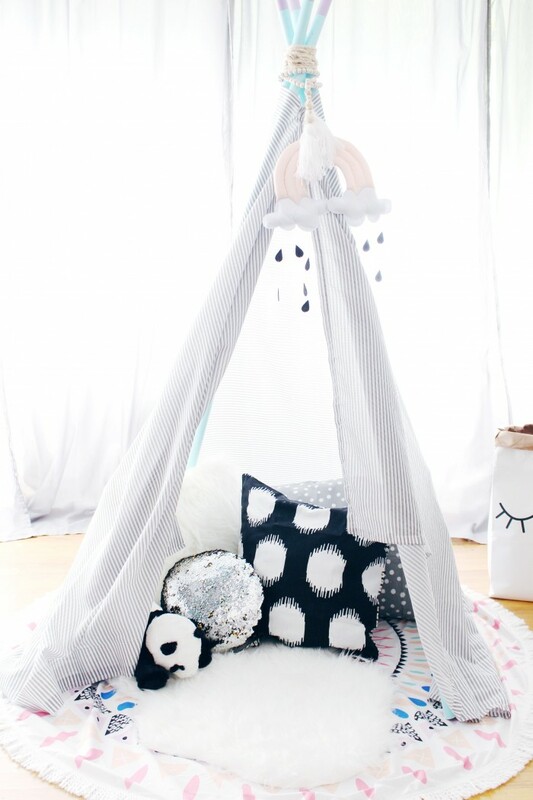 Kid’s play teepees. They are so cute and somehow so necessary even though they’re not at all necessary, am I right? 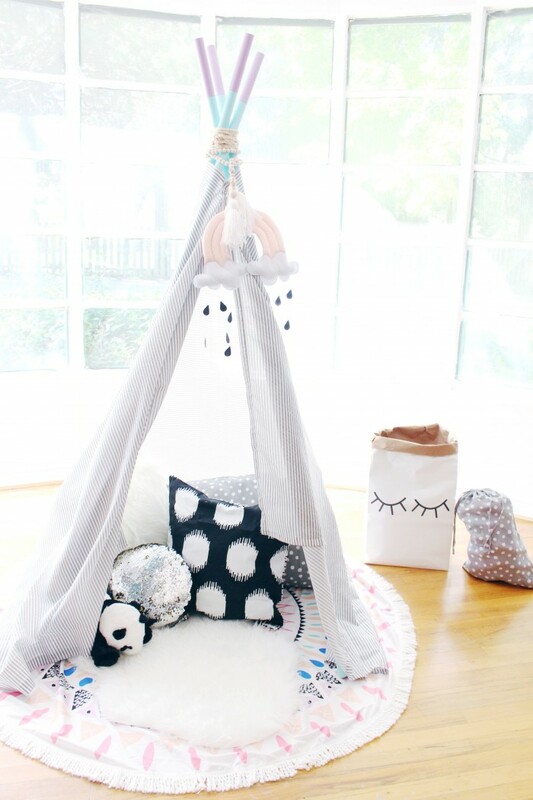 I’ve seen a ton of cute ones all over; mainly in amazing children’s room photos on Instagram or Pinterest. And you can certainly buy them at Target or Land of Nod (and they’re amazing and adorable for sure!) but they’re like $75-$200. Yikes! I don’t even want to spend that kind of money on a waterproof tent my kid could actually sleep in outside. So I’ve had it on my mind to DIY one for a while. I’ve been revamping our play room for the last couple of months for a couple of reasons. One is that it’s the large room that connects to our living room via an open double doorway. So its very visible and the walls were brown. I can live with some brown walls being hidden away in my home, but when they’re all in your face like this room was, I just couldn’t handle it anymore. So I busted out the white paint and some aqua blue paint for the bookshelves and now the room is much more cute, welcoming, and playful. But the main reason I felt the need to liven up the space, and add some new playthings, was because my kids and I were basically home for 6 straight months this last winter. After my newborn got so sick he was hospitalized, we decided we couldn’t be too careful and basically shut him off from the world. There were weeks where I only left my house for 30 minutes, just to drive and pick up some dinner and come right back. I can’t say it was as wonderful as it probably sounds….being stuck inside all the time, getting no sleep, still battling sicknesses, and seeing few people other than your two littles can be hard on an extrovert like me who already gets depressed during winter. But, thats a whole other discussion! 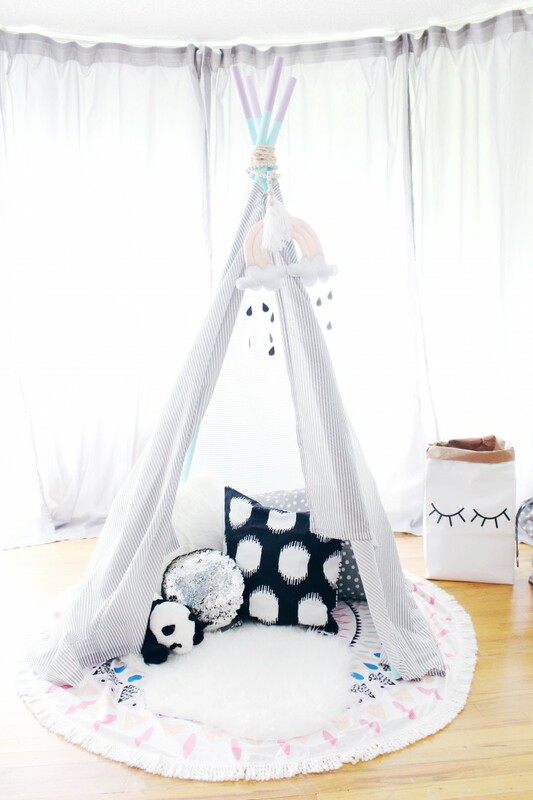 What it boils down to, for this DIY post, is that we needed to get some new life into our home for my 3 year old. She was a champ this winter and keeping her cooped up wasn’t as bad as I thought it would be. But after 6 months, anyone would be sick of their digs. 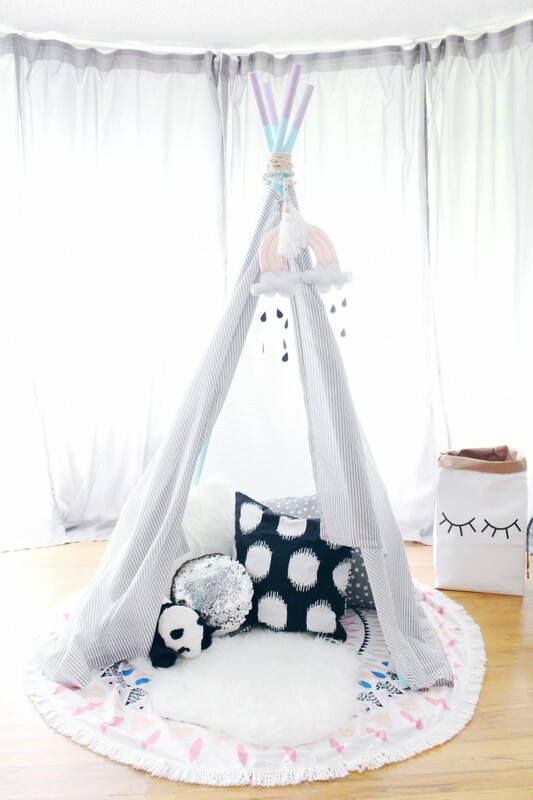 So of course a cute play teepee was at the top of my list! I was THIS CLOSE to buying one on sale at Target, think it would’ve rang in at about $60, but they didn’t have the one I really wanted at my store so I didn’t feel it was justified. Originally when I was planning to DIY it, I was going to use wood dowels and I thought I’d spend about $40 on the whole thing. But then Home Depot didn’t even have big enough dowels in store and once it came down to paying shipping, and waiting on the shipping, I decided the cost wasn’t worth a DIY anymore! Plus sawing and sanding…ew. I decided instead to grab some 3/4″ PVC piping and make do! And I’m so glad I did! I’m super thrilled with how this project came out. 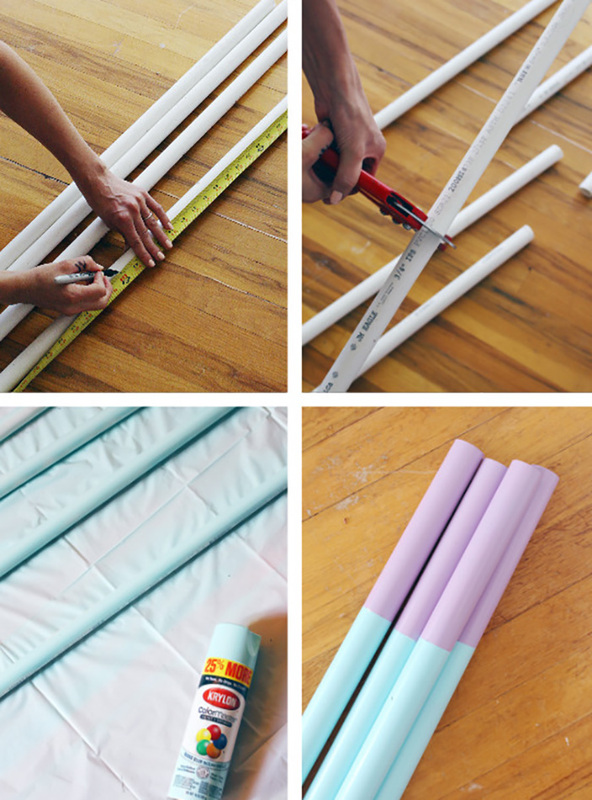 Its just what a DIY should be: easy, lovable, and maybe most of all, very cost effective! I spent around $7 on the pipe and used a curtain I already had but came in a pack of two from IKEA for $10. I already had the spray paint and rope but even if you needed to buy those things, you’re looking at under $20 for the whole thing still. Anytime I can cut off 50% or more from the original cost, that’s when I think it’s worth it and exciting! No sawing, sanding, sewing, swearing, or sorrow! (haha, that was fun). Decide on how tall you want the pipes to be, I went with 5 feet. Measure here and use your pipe cutters to cut. Spray paint all pipe pieces in the main paint color in several light coats and allow to dry. I didn’t get a picture of this step, but if you want the tops to be a different color like mine, put painters tape around the same part of each pipe and use your second color for the tops. Cover the bottom of the pipes while spraying! 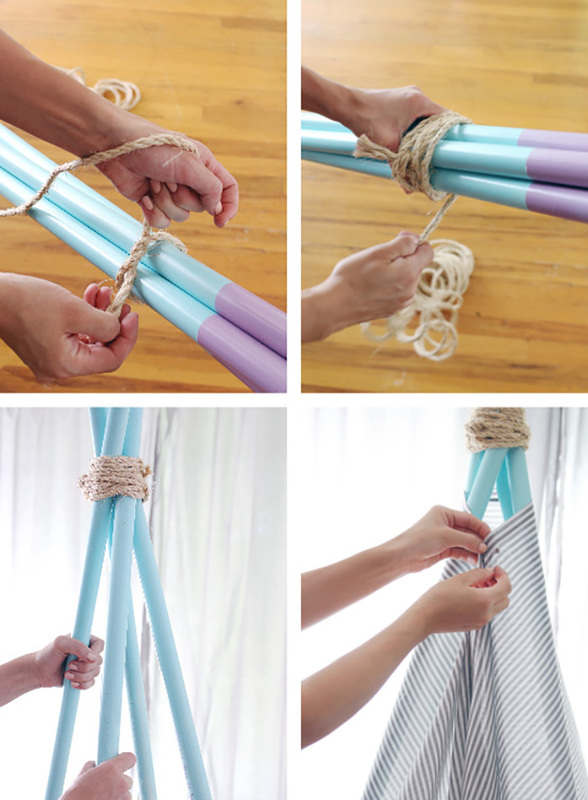 Tie a length of rope tightly around all pipe pieces, under the top color. Wrap very tightly around the pipes several times. I don’t think you can be too tight here.. Cut off rope and tie again. Stand the pipes up and spread them out into a square at the bottom. It takes some time to get it just right but just mess around with it. 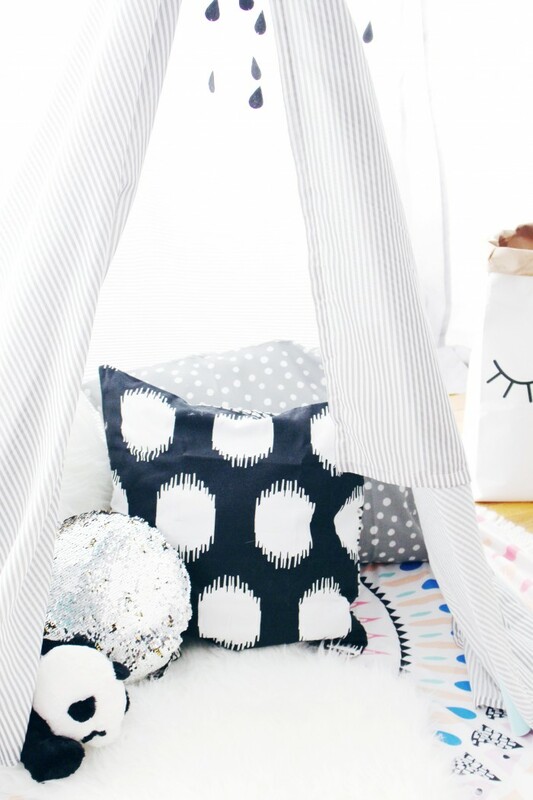 Drape your fabric or curtain over the pipes. Use a safety pin to close at the top in the front and allow the fabric to drape open. My Stella squealed really loud when she saw her tent and played in it all night. She tried to sleep in it for several nights before she understood I just wasn’t gonna let that happen haha. Now it rests happily in the corner of our play room and she loves to snuggle up in it to watch her tablet.